The Hotel is in a special position – in spite of being a short walk from the town centre and sports complex, it enjoys an enviable tranquillity, to ensure the most relaxing holiday possible! A comfortable, quiet hotel, newly built, with fantastic views towards the Brenta Dolomites. 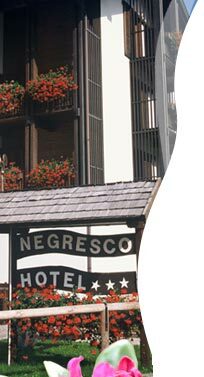 The Hotel Negresco is managed by its owners, and all the rooms have bathroom, telephone and satellite TV. We also offer a bar, lounge with open fire, dining room, lift, garden, car park and private garage. All meals are cooked by the owners.